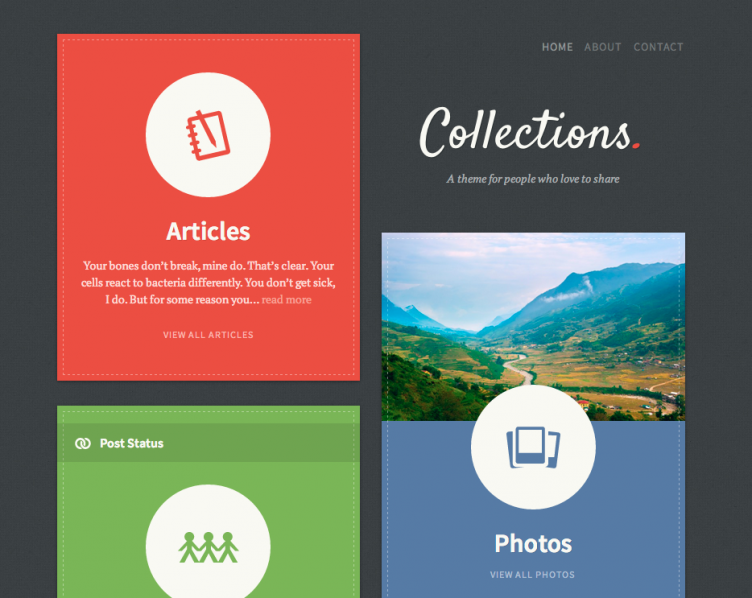 The folks from The Theme Foundry have released a new theme called Collections, which is a post formats centric, Backbone powered WordPress theme. They emailed me to let me know they were wrapping up a Backbone powered theme, and I was intrigued and asked if I could take a closer look. So they showed me a demo preview of the theme along with a copy so I could peak at the code to see how it was structured. I came away pretty impressed. The theme has some basic options for filling out social information and optionally showing extra about content for the home page. But what’s more interesting is what this theme doesn’t support. There are no built in widget areas, and custom background and custom header images are not supported. Collections makes decisions for the users. I was pretty excited to play with this theme. I love when companies take risks like this, and push the envelope for a market. Collections reminds me a bit of the move The Theme Foundry made in 2010 with the Shelf theme that was the first ever paid theme on WordPress.com, and was the top seller for a while. It’s bold, and beautiful; but also very targeted and specific. I think they’ve got a pretty good chance of success here. And if nothing else, I imagine that other developers will take note of how nice the Backbone features are for the user experience and site speed, and we’ll start to see more of that pop up in other themes. The theme looks great and does load super fast. How much of this is because of backbone and how much is it because they have great servers and all their themes load pretty quickly. I expect that they will sell the heck out of this one, if for no other reason, because other designers will want to know how it’s made. Best of luck Drew and co. Nice guys and good themes. You should definitely see an improved page load time with this theme. 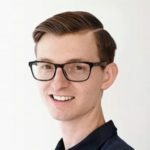 Moreover, if you use some of the popular WordPress page caching techniques out there, you will further improve your page load speeds. The plugin is open source so we’d love to see pull requests or additional feedback from developers. Ah great. Just in time Chris! Thanks Chris! We took a serious look at PJAX before starting this project. One of the advantages of BackboneJS is the amount of control you have over the app. It has very little opinion, which was an asset to this project. It really helped us mold a single page application experience to some of WordPress’ quirks. I was worried that PJAX would not give us that flexibility. That said, when the library lacks an opinion, you generally need to do a lot more work so it was quite an effort to get the Backbone code working with WordPress. Are there any intents to release the Backbone component of the theme as a separate script, i.e. in a case study? Hi Pascal! There are no plans to release it yet. The code is too closely coupled to the theme for it to be a useful component at this point. We will be writing a lot about this in the next month. We do want to share what we learned, but the code would not be too helpful at this point. This is the coolest WordPress theme I have seen in quite a while. Love how it demonstrates the power of Backbone.js (I’ve added to my Backbone resources). The design is gorgeous too, love the subtle transition effects. Well played guys! I suspect we’ll more use of Backbone on the frontend of WordPress themes in the future! Really impressive work, guys. Thanks, Brian, for the summary. Neat-looking theme. I can’t even express how excited I was when I saw the launch of then aptly named “Collections”. (For those of you who are new to Backbone.js you have Models, Collections and Views in them 🙂 ). I’ve just bought the theme then and will be having a dig through the code as well to see how they implemented it. I’m a sucker for The Theme Foundry themes! Woot! Thanks Bronson! Look for an update tomorrow. Already squashing some bugs. Good stuff Zack 🙂 I shall hold back on my child theme until tomorrow then!